Spray foil with a nonstick cooking spray. Place the cut carrots on the foil. Mix the lemon juice, butter, sugar, and thyme. Pour over the carrots; then fold the foil to make a packet. Place on the grill over medium heat. 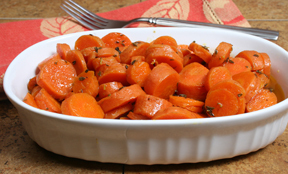 Cook for 10-15 minutes, just until the carrots are crisp tender. Open the packet and stir occasionally and check for doneness. Garnish with lemon zest if desired. Serve immediately.